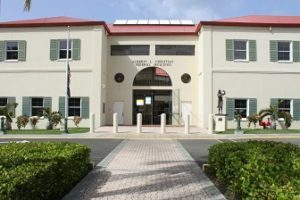 In separate, unrelated cases Wednesday, District Court Judge Curtis V. Gomez sentenced two men – Kenneth James, 51, of Dominica, and Dean Baptiste, 53, of St. Thomas – to prison, according to U.S. Attorney Gretchen C.F. Shappert. – James was sentenced to 78 months incarceration for conspiracy to distribute cocaine. Gomez also ordered James be sentenced to five years of supervised release, pay a $100 special assessment, and complete 400 hours community service. According to the plea agreement filed with the court, on Aug. 15, 2017, James was arrested by agents of the Drug Enforcement Administration after he tried to sell to an individual approximately 12 kilograms of cocaine. James attempted to sell each kilogram of cocaine for $13,500. The case was investigated the DEA and prosecuted by Assistant U.S. Attorney Sigrid M. Tejo-Sprotte. – Baptiste was sentenced on separate indictments charging conspiracy to traffic illegal aliens and bank fraud, Shappert said. Gomez sentenced Baptiste to 18 months in prison, plus three years of supervised release for the bank fraud and four years supervised release for the alien smuggling. The periods of supervised release are to run concurrently. Gomez ordered Baptiste to pay a $200 special assessment, perform 400 hours of community service, and to pay restitution in the amount of $11,197.47. According to Shappert, Baptiste pleaded guilty Nov. 21, 2017, to conspiring with others to bring illegal alients into the United States and harbor them. He also pleaded guilty to one count of bank fraud. Documents filed in court said Baptiste and others assisted individuals traveling from India to enter the United States illegally. The illegal aliens traveled from India to St. Kitts, where they boarded commercial flights to Tortola in the British Virgin Islands. Once in Tortola, they were transported by boat to St. Thomas, where arrangements were made to transport them to the mainland United States. Court documents further showed Baptiste obtained and altered a check not issued for his use or benefit and substituted the name of his business, D/M Computer Consulting Services. Baptiste subsequently deposited the check into his business checking account and withdrew the funds for his personal use, the court records show. The case was investigated by Homeland Security Investigations and prosecuted by Assistant U.S. Attorney Everard E. Potter.